Advantage portable and central water chillers use high pressure and low pressure limit switches on the refrigerant circuit to prevent circuit damage due to out-of-spec operating pressure. Depending on the model of the Advantage chiller, separate high and low limit switches could be used (as pictured) or high and low limit switches in a common housing. Refrigerant limit switches are wired into the 115 volt control circuit of the compressor. Both high and low switches are normally closed. If either limit switch detects a pressure outside its prescribe parameter, the limit switch will open the control circuit and the compressor will stop. Mounted on the discharge side of the compressor. Optimal refrigerant high pressure in Advantage water chillers is 210 PSI. High pressure limit switches will cut-out at 325 PSI. 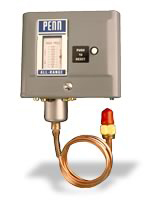 There is no allowable field adjustment of the high pressure limit switch. If the chiller cuts out on the high pressure limit the cause must be isolated and corrected before operations can resume. Mounted on the suction side of the compressor. Low pressure fluctuates with process water temperature. 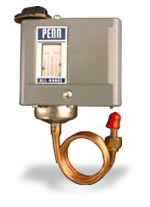 Field adjustments of the low pressure limit switch are allowed when setpoint below 48°F are required. Typical use of refrigerant pressure limit switches on Advantage central chillers. The high and low pressure limit switches are connected to the refrigerant circuit, which is pressurized at all times. Only a qualified refrigeration technician should service the high and low pressure limit switches. For more information about refrigerant limit switches call the Advantage Sales Department at 317-887-0729. Would you like to Download FYI #157 to your browser?